On a beautiful Thursday morning, I hit the road towards Oklahoma City. It only took about half an hour to get there and I must say I was very impressed. I took a drive through the downtown area, past the stadium and botanical gardens, through Bricktown and what seemed would be a nice nightlife area. 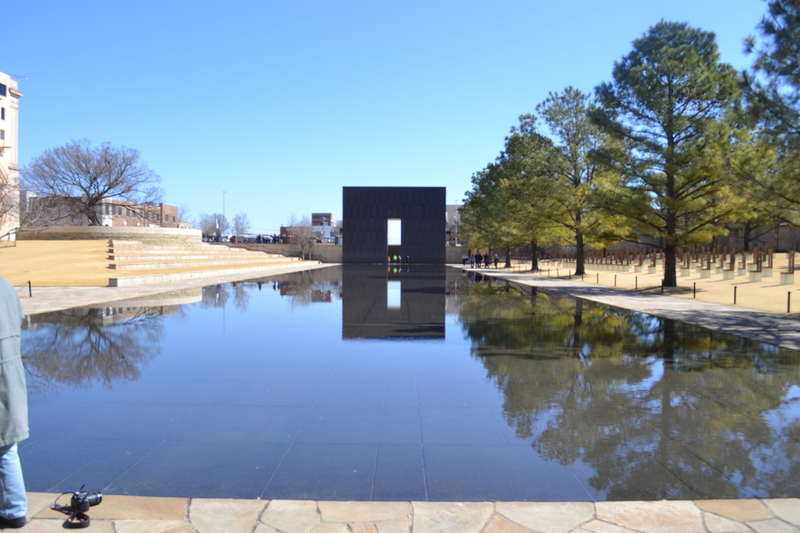 However, the one place that will always stay in my heart was the Oklahoma City National Memorial & Museum area. 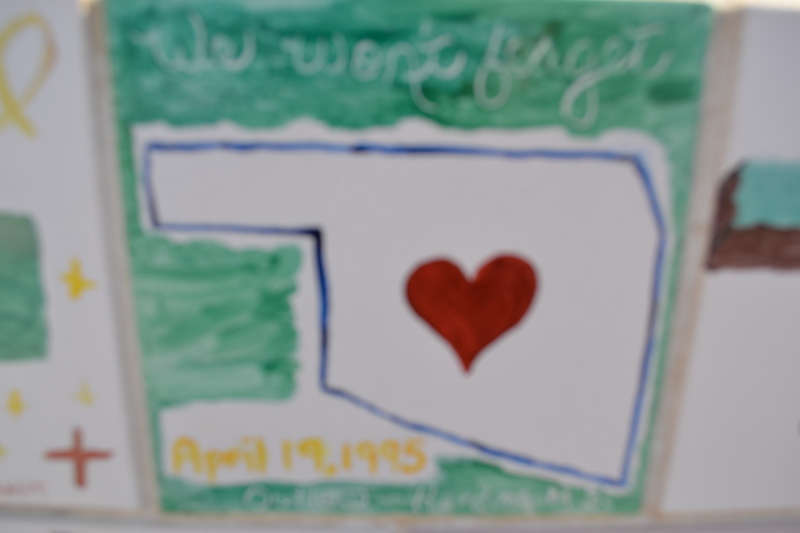 It’s hard to believe that it’s been nearly 19 years since that tragic April day in 1995 where 168 people senselessly lost their lives in the bombing at the Alfred P. Murrah Federal Building. 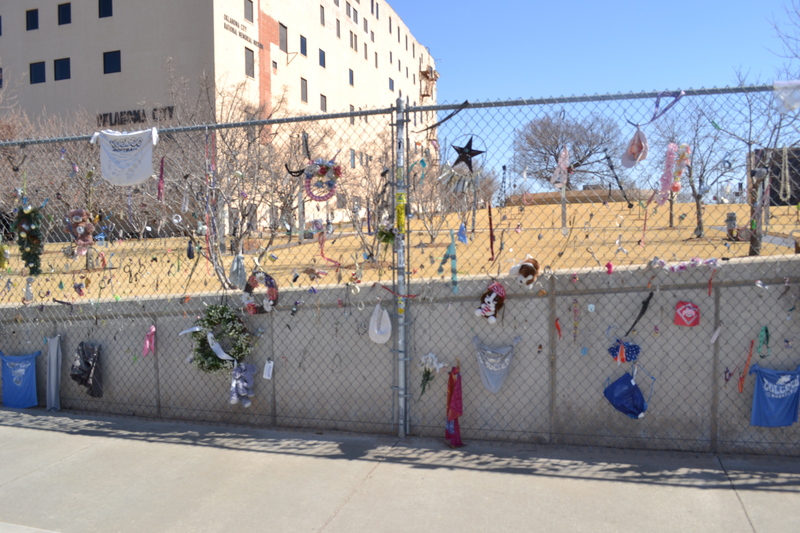 I parked the car across from the museum and made my way over, and I figured it would be a nice area with a few mementos here and there, but what I saw and the feelings I felt were things I never expected. The first thing I saw as I crossed the street was simply a fence. Just a regular looking fence that you or I could have in our yard, but what filled this fence is what truly makes it special. 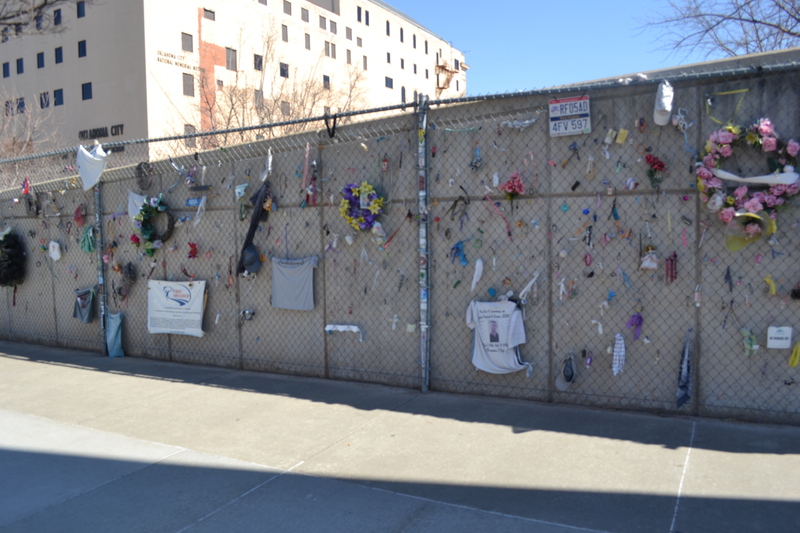 Up and down The Fence are tributes. I spent quite a while looking at all the tokens of affection that have been left over the years, somewhere in the range of 60,000. 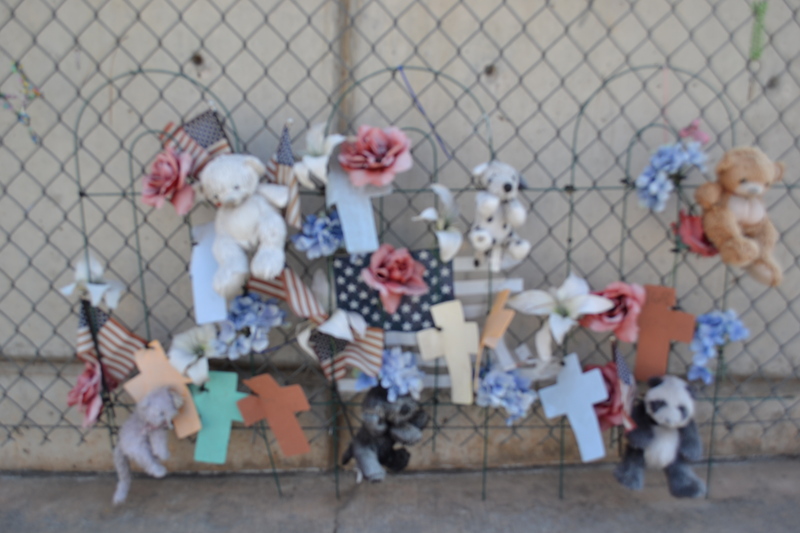 Whether it was pictures or a flag or a teddy bear, each individual item served as a memory for those that had been lost. 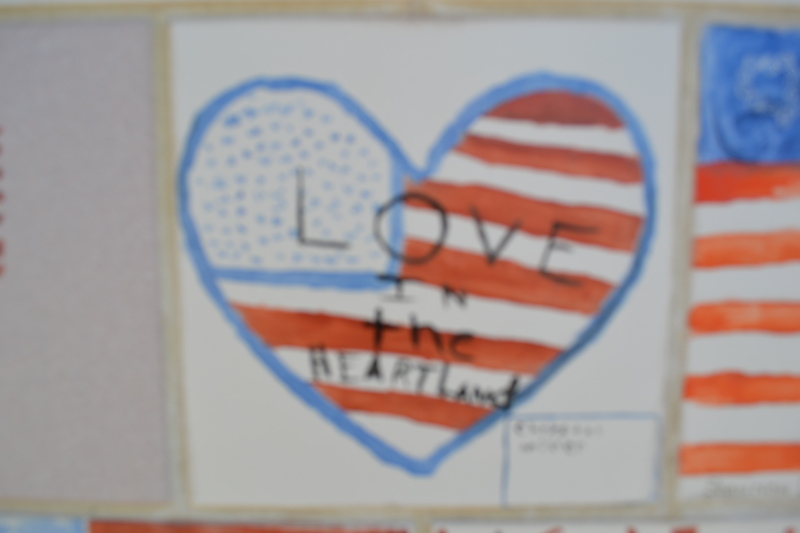 Some were from the day after the bombings and some were from the day before I arrived, a reminder that the people around here haven’t forgotten a thing. 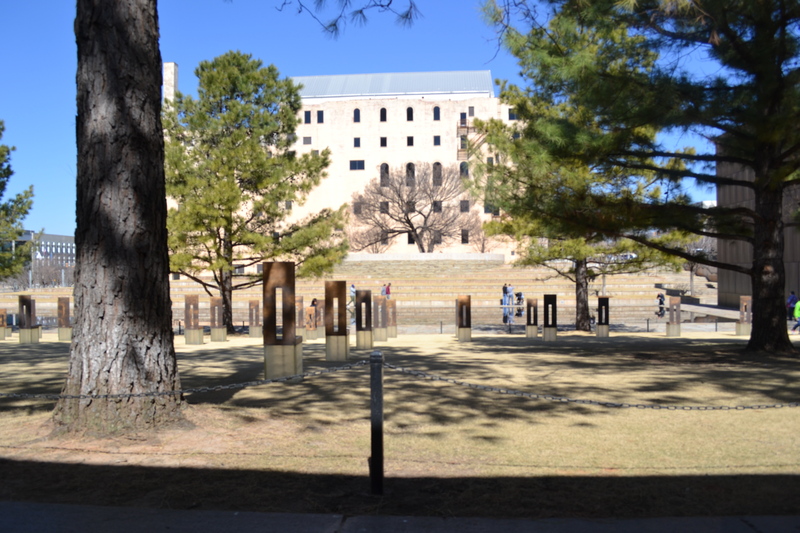 I decided against going into the museum for some reason, and instead focused my time on the Outdoor Symbolic Memorial. 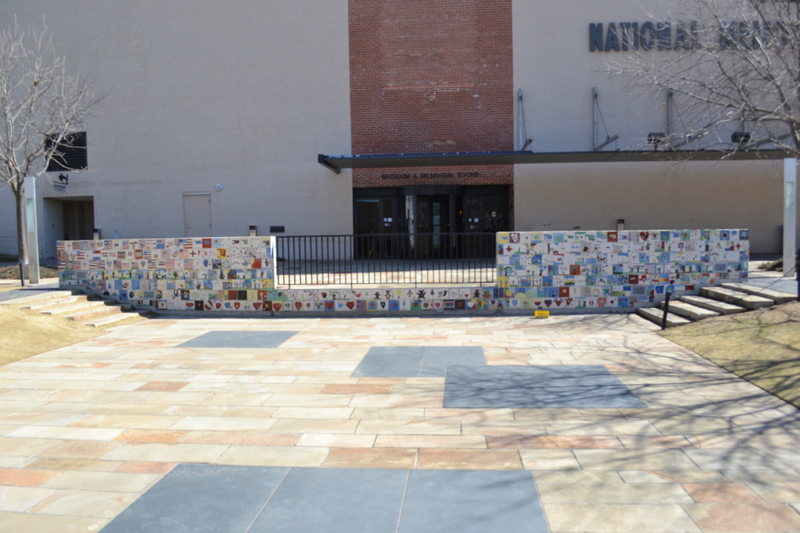 After walking along the fence, I ran into what is simply known as The Children’s Area, a wall of painted tiles that were sent to Oklahoma City in 1995 from children all over the nation. 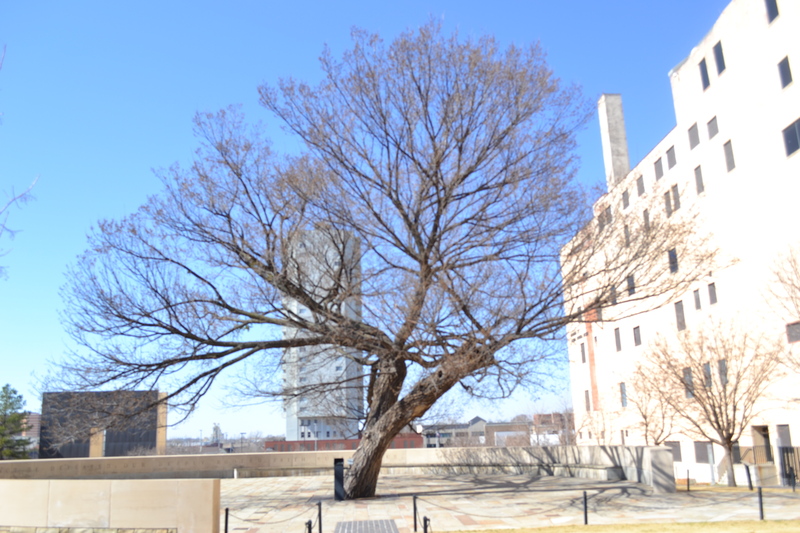 I made my way towards the Survivor Tree, which is truly inspiring. Now, the reason it looks like a regular old elm tree is because it is. 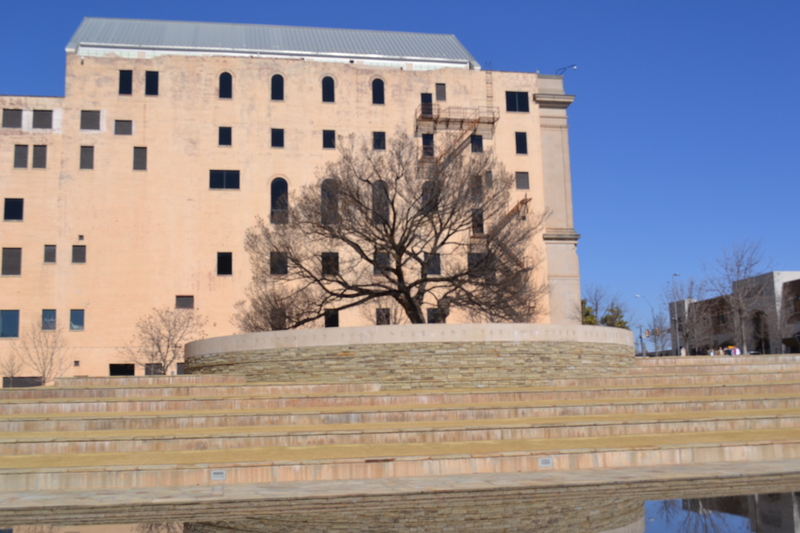 It’s now over 90 years old, but it now serves as the symbol of survival in this city. I don’t know why, but this tree had me in awe. I sat for at least half an hour just staring at it, taken in by its strength and beauty. In reality, it should not have survived the blast of the bomb, but it now stands strong in the heart of this memorial, with a message to all of its visitors: “The spirit of this city and this nation will not be defeated; our deeply footed faith sustains us.” Nothing I can write could say it better than that. I continued my walk along the granite path that was the footprint of the old Murrah building, the granite itself salvaged from the plaza. 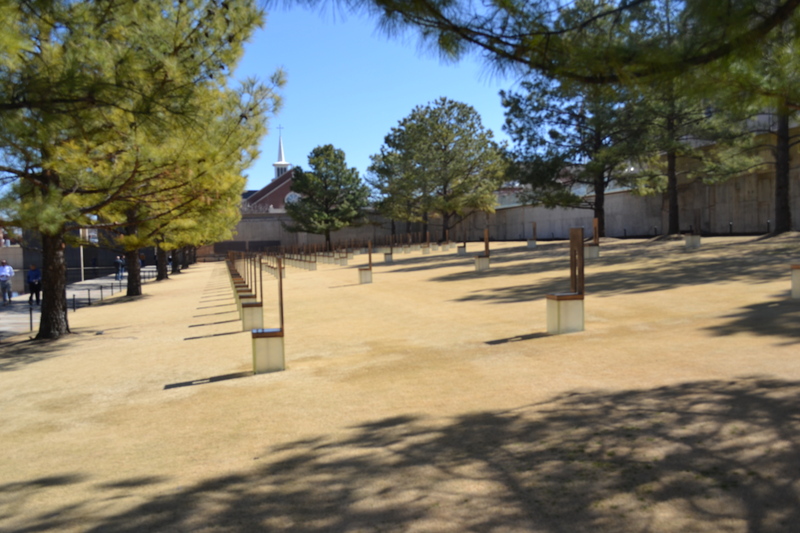 It outlines the Field Of Empty Chairs, each chair symbolizing one of the 168 lives lost that day. 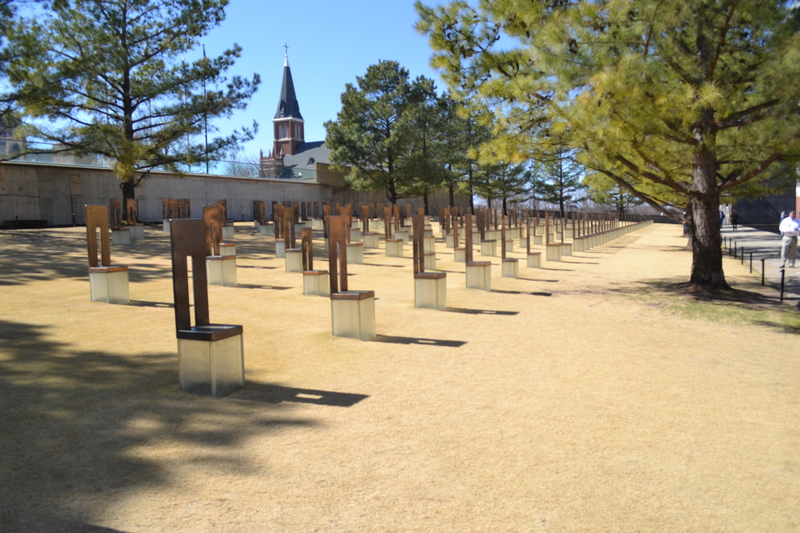 Made of bronze and stone, each chair rests on a glass base etched with a name of a victim. I didn’t notice at first, but as I walked through it, I realized that the nineteen smaller chairs represent the children taken way too soon. My heart hurt. As I walked down each row of chairs, looking at the names of all of these innocent people, I began to tear up. There’s an aura around this entire place that really hits hard. It’s very quiet, almost eerily so. Everyone seems to only talk in whispers while walking around, a great show of respect to each of individual chair. 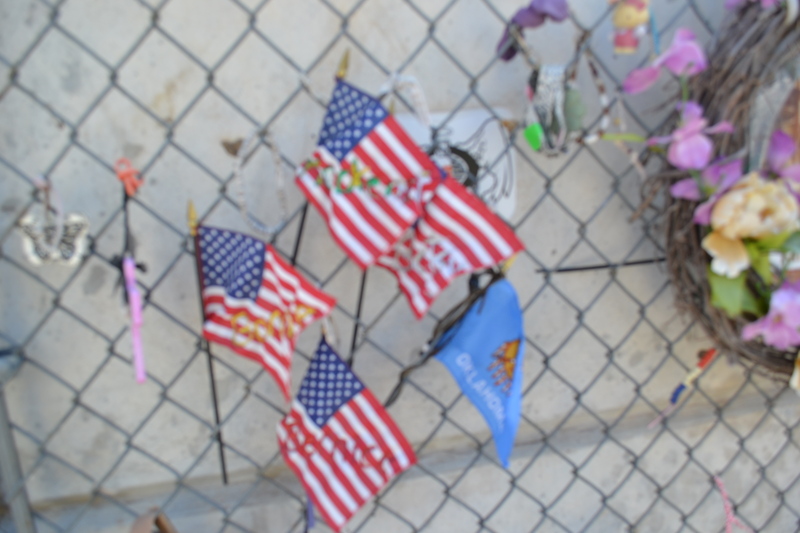 As the tears rolled down my face for these people that I had never met, I could only imagine what the family members had gone through, similar to how I felt during 9/11 or the Newtown tragedy. In that moment, I don’t think I had ever been so humbled. As I walked back to my car, I knew that nothing else in that city could live up to what I had just experienced. I just wanted to drive,so I found I-44/I-35 East and did just that. I hit Kansas right around 3:00. I’m not exactly sure why Kansas charges you to drive through their state, but they do. I hit Wichita, Topeka, and Jayhawk country, but there really doesn’t seem to be much going on, so I pressed on and hit Kansas City (the Missouri side) around 7:30. I’d really like to say that my night in KC was exciting, but by this point in the trip, I was drained. The hotel I stayed in had a really nice bar and grill, so I was still able to have some BBQ and some Boulevard, so I was content with that. Anyone who knows my mother knows that she is a HUGE Wizard of Oz fan, so as I got to Missouri, I was excited just to text and tell her that I wasn’t in Kansas anymore. She obviously responded with a text that read “Click your heels three times. 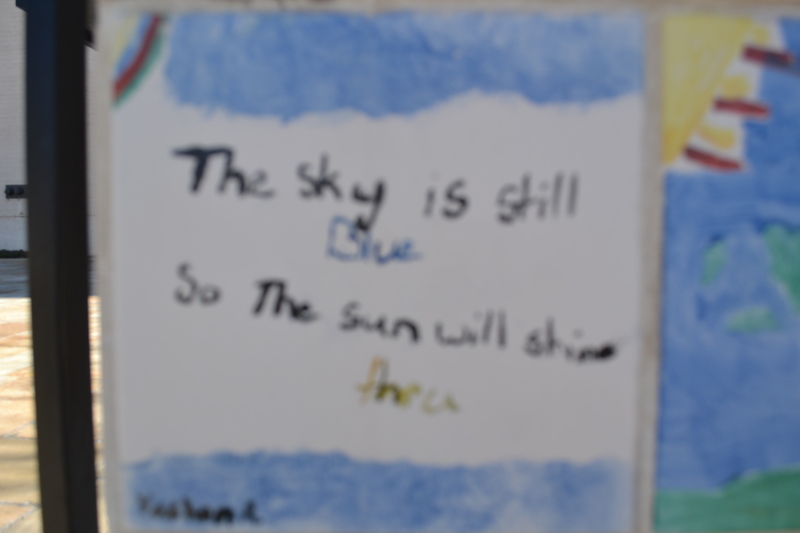 There’s no place like home.” After the emotions I had felt that day, I knew she was right.